YOU are so very generous. And, have I mentioned, encouraging? Fabulous. I found a great curriculum called “The Art of Poetry” from Classical Academic Press, that we are using this year. Your pages will likely coordinate with it somehow!! Thank you so very much Barb. 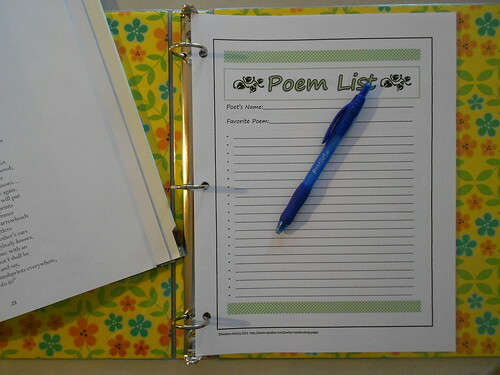 Our 12 yo told us that she wants to study poetry this month (we do a monthly mentoring/planning time with each child) and I am going to print some of these pages to see if she would like to follow your plan. thank you for sharing! Barb, I am sitting here wondering how many jewels will be in your crown in Paradise. As far as I’m concerned, you can have mine, too (assuming I’ll have any!). Thank you, thank you, for all you do. I’m filing away so many of your nuggets of wisdom for our high school years! Fantastic resource! Thanks so much! You are all very welcome. I am so glad that I have some time right now to share all the things we are doing that may help other homeschooling moms. I know from experience that poetry can be daunting and I have tried to make it as simple as possible keeping in mind my Charlotte Mason leanings…I still want the boys to do a little deeper look at poetry as they go through high school. Taste and see that it is good!